3… 2… 1… Happy New Year! As the fireworks fade and the flow of champagne slows to a trickle, the conversation on New Year’s Eve inevitably comes around to what everyone wants to achieve over the next 12 months. For some, this involves looking back at the year that was and identifying areas where there’s room for improvement. From a tech security point of view, backups were an obvious weak point for many, with research from BackBlaze indicating that just 9 percent of people backed up their most precious data daily in 2017, while more than 1 in 5 never made any backups at all! Whether you want to lose weight, stop smoking or strengthen your security practices, sticking to a New Year’s resolution all comes down to having a game plan. While we might not know much about sculpted six packs or be able to help you give up your vice of choice, nobody does it better than us when it comes to IT security strategy. 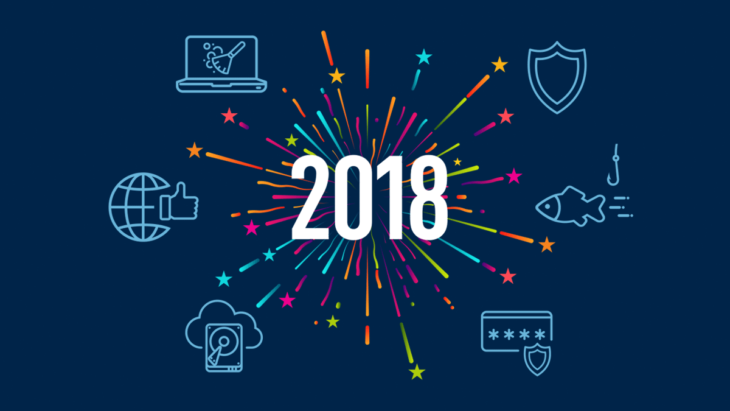 Here are 10 New Year’s tech security resolutions to help you get your computer in the best shape of its life and ready for the threats that lurk in 2018. This year, commit to following a cornerstone rule of IT security: making regular backups. Being able to restore your computer to a previous, safe state provides you with the ultimate peace of mind in the event that your computer is infected with some nasty malware. Backups have become increasingly important in recent years as ransomware attacks continue to ravage businesses and home users alike. While decrypter tools offer a solution for some ransomware, the fact remains that many strains do not have decrypters. A behavioral anti-malware product, paired with regular backups, is your best defence against ransomware. Designed to exploit human nature, phishing scams remain one of the most common and effective forms of cyber attack as they target the weakest link: you. Around 3 in 10 people readily open phishing emails, according to the results of a recent study. This year, keep your sensitive information safe by making it a priority to avoid being duped into any phishing scam. There are many ways to achieve this, including being mindful of what you click on, checking websites for their security certificates, regularly updating your internet browser and using a trusted antivirus product. Brush up on the key indicators now with our detailed phishing scam guide and spot a scam from a mile away. Windows Defender does a half-decent job of protecting your computer against some digital threats, but it’s far from a comprehensive solution. If your New Year’s resolution is centered around giving your computer the protection it deserves, it might be time to invest in a proven anti-malware solution. Your best bet is to look for a product that uses behavior blocking technology, as this provides protection against even unknown threats. If you value antivirus software that provides stellar protection without devouring system resources, feel free to download a free 30-day trial of Emsisoft Anti-Malware and judge for yourself. Navigating the settings menus of your favorite social media platforms might not sound like the most fun way to bring in the new year. Nevertheless, setting up privacy filters is a very worthy resolution for anyone who wants to keep their personal information safe from prying eyes in 2018. How do you do it? Well, unless you’re a budding social media star, you can start by making all your accounts private, creating groups with different levels of access permissions and, where possible, disallowing your account to be indexed by search engines. In addition, you can take greater control of your privacy by disabling auto location tagging and unticking any options that allow friends to tag you in photos. At best, ads are unsightly blemishes on the face of the internet. At worst, they’re a source of potentially unwanted programs (PUPs), malvertising and invasive cookies that track your browsing. Make it your New Year’s resolution to do away with online ads once and for all by installing an ad blocker for your browser of choice. It takes less than a minute to do so and can do wonders for your online experience. While there are many options to choose from, the Emsisoft team recommends uBlock Origin, a free, open-source ad blocker that’s compatible with most major browsers. From bank accounts to social media and everything in between, at times it seems like modern life revolves around usernames and passwords. In fact, research indicates the average person has a whopping 19 passwords! No wonder then that “123456” and “password” continue to be the most popular ones in use. If you struggled to juggle all your passwords in 2017, make a commitment in the new year to keep them better organized. Reputable password managers such as LastPass and Sticky Password offer a safe, effective and reliable way to keep track of all your passwords. This allows you to protect your digital life with complex passwords while eliminating the need to remember the character combinations for dozens of different websites and apps. It might not be seasonally accurate (depending on where you are in the world), but giving your computer a Spring clean is an excellent way to start the new year with a fresh slate. Is your desktop background hidden behind a mountain of icons? Now is the time to declutter. Go through and delete any miscellaneous files (old downloads, screenshots and the like), and move rarely used important files to folders elsewhere on your computer. The only icons remaining on the desktop should be a few of your most commonly used files, folders and/or applications. You can remove additional clutter, free up disk space and reduce the risk of unwittingly hosting PUPs by uninstalling programs you never use. Scroll through your list of installed apps (Control Panel > Programs and Features) and remove any software that you haven’t used in the last few months. Verify any unfamiliar app before uninstalling it to ensure you’re not removing a driver or some other important piece of software. In addition to giving your devices a virtual clean up, it may pay to also give them a physical wipe down. Why? They’re dirty. Very dirty. For example, research shows that the average computer keyboard has about 150 times the accepted level of bacteria, while 16 percent of cell phones have traces of poop on them! Clean up your act in the new year by regularly giving your tech devices a thorough scrubbing throughout the year. Using a microfiber cloth or a soft tissue with rubbing alcohol is safe for most surfaces and is usually strong enough to get rid of most types of germs and bacteria. One of the most effective things you can do in 2018 to instantly level up your security is opt in for multi-factor authentication (MFA). As the name implies, multi-factor authentication is a system in which you’re required to supply more than one type of identification at the login stage to prove you are who you say you are. For instance, when logging in to your bank account, you may be required to input a verification code that’s sent to you via text. This is an easy New Year’s tech resolution to keep: When a website or app asks you if you want to enable multi-factor identification, simply say yes and fill out the required information. Setting it up takes a matter of seconds but provides a very effective layer of protection that minimizes the risk of identity theft. The convenience of public Wi-Fi can’t be ignored, but using it does pose a very real threat due to man in the middle attacks, in which hackers position themselves between your computer and a website, and intercept the data you send and receive. This gives hackers the opportunity to get their hands on your passwords, emails, banking information and much more. With this in mind, make it your New Year’s resolution to avoid sending important data over public Wi-Fi. While it’s fine to use public Wi-Fi for regular browsing, never use it to login to password-protected accounts or make bank transactions. If you have to use public Wi-Fi for important work, be sure to use a VPN to create an encrypted connection. Sticking to a New Year’s resolution isn’t always easy, but having a clear strategy in mind can drastically improve your chances of hitting your goals for the year. With the information in this article, you’ll be in a great position to get your computer fit and healthy in 2018. What’s your security New Year’s resolution? Let us know in the comments below! Have a happy (malware-free) New Year!